So, did it happen to you? You attend a Christmas party and out of the blue someone hands you a gift. You look at your spouse and realize you both came empty handed. You respond, “Oh, you shouldn’t have!” You’re embarrassed because you have nothing to offer in return. You reluctantly receive the gift. On the ride home you and your spouse quickly stop by a store, pick up something random of comparable value and get it into the hands of the giver at your earliest convenience. Sure, it wasn’t very thoughtful and it was done more out of obligation, but at least now you’re even, right? We don’t like to leave a gift unanswered. Maybe it makes us feel like the balance of the universe is off. So we try to repay it. Ahh. now equilibrium is restored, right? 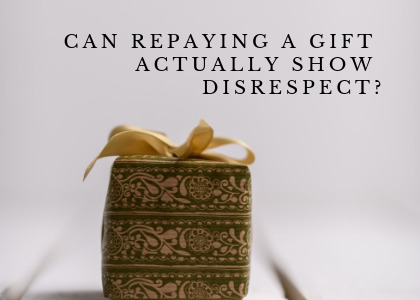 Have you ever paused to consider how repaying a gift may actually show disrespect? Now I realize that a return gift is sometimes expected, especially in some cultures. However, the initial act of giving a gift brought joy to the giver and was intended to bring joy to you. Any attempt at repaying may comfort your conscience, but it’s also likely to diminish joy. The Bible uses an amazing Greek word, charis. 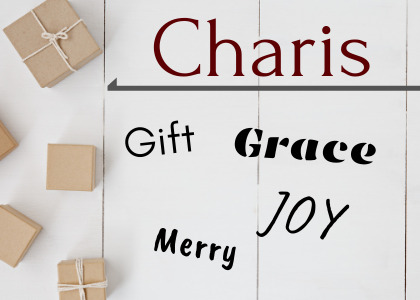 Derivatives include “gift,” and “grace,” as well as “joy/merry.” So, how can one word cover such an array of meanings? It turns out that same connection actually helps you better understand what each means individually. “For it is by grace (chariti) you have been saved” (Ephesians 2:8). “The gift (charisma) of God is eternal life” (Romans 6:23). No wonder the angel announced, “I bring you good news of great joy (chara)” (Luke 2:10). However, if I misunderstand one, the ripple effect can be like dominos and I can lose them all. If I don’t grasp that grace is God’s unmerited favor, then I’ll always find myself trying to repay the gift and I’ll lose out on the true joy. One of the most commonly quoted Mormon Scriptures says, “For we know that it is by grace that we are saved, after all we can do” (2 Nephi 25:23). They see God’s grace as a power to help keep the commandments. Since it’s a message focused on repaying God, it misses the beauty of the gift and it’s void of true joy. 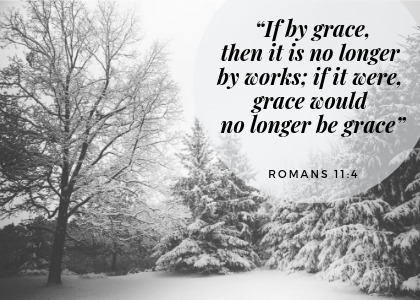 The Bible paints a very different picture by contrasting grace with works: “If by grace, then it is no longer by works; if it were, grace would no longer be grace” (Romans 11:4). It’s grace. It’s a gift. And it brings great joy! It brought God joy to give that precious gift lying in a manger. Heaven couldn’t contain the angels’ song of praise. There’s no need to feel awkward at this gift. There’s no need to repay (and you couldn’t anyway). The appropriate response when you encounter grace is to marvel in awe and share it with others. God fill you with joy (chaírō) at Christmas and throughout the year. Share this video with family and friends to help them discover the amazing gift of grace.